There are a lot of shavers in the market today for each and every man according to his budget. Starting from premium-quality expensive electric shavers that cost a few hundred dollars down to cheaper and highly affordable models in the range of under $50 shavers, in this article, we’ll be directing our focus on the affordable models particularly the best electric shavers under $50. Sit back and read on as we take you through this trip to check out some of the really great shavers in the unlikeliest of price ranges. Can you really find good electric shavers under $50? Are these under $50 shavers good for everyone? A lot of people would like answers to questions like this and so we’ll start our discussion from here. So, if you’ve been wondering if you can find a really good electric shaver under $50, the simple answer is yes. The Philips Norelco Shaver 3100 is one such example. At under $40, it has a decent build quality, ultra-precision blades to glide smoothly over the skin for a smooth and comfortable shave as well as other great additions that includes a pop-up trimmer, LED display, and protective cap among others. This is the only place where there may be issues. Generally, if you have a soft, thin hair, you’ll be fine with any of the good foil shavers priced below $50. If on the other hand, your hair is longer, thicker, or curly, you’ll be better served by a more powerful shaver such as the Braun Electric Shaver Series 7 790cc. You may also check out our article on the Best Electric Shaver for Black Men. We used black men hair since most black men usually have thick and curly hairs. If a shaver can handle the hairs of an African-American comfortably, then it will no doubt handle others easily as well. What makes a good shaver good? So we said you can find good electric shavers under the $50 range but this is the part where you understand what we mean by good. For a shaver to be qualified as good enough for anyone to shave with, it must have a decent combination of the following criteria. Once a shaver is able to meet these base criteria, then it is a good as any other one even if it does not flaunt the fancy features of the premium-priced models. So we said your budget shaver should still offer you decent and satisfactorily good performances. It is the distribution of features as well as the design that will determine how good your shaver is. So when you are in the market for the best budget electric shaver, it is important that you check the product you intend to buy if it has all or many of the following features. These types of heads can be either rotary heads or floating foils and their major advantage is that they’ll help the shaver follow and conform to the contours of your face, head, and anywhere else you may want to use them. This would allow your device to perform with clutters and hindrances getting in the way. There are shavers under the $50 range that allows for cordless operation so you don’t have to get them plugged in before you can start shaving. The ease of use as well as cleaning and maintenance has a lot to do with design. In our review of the best electric shavers under $50 which is the concluding part of this article, you’ll find models like the SweetLF Electric Rechargeable Shaver and six others with a ridiculously low price under $30 despite being super easy to use and clean as you can simply rinse it under running water after use since it is waterproofed. This feature in your shaver helps it to easily trim places such as the nose, sideburns, mustache, and more that would ordinarily be hard to reach. Almost all of the products in our best budget electric shavers have this feature to make your shaving experience, easier, and more exciting and complete. Your shavers’ blades would usually get blunt after a while of regular use. It is therefore important that these are replaceable and done as at when due. All models in our recommended category of the best electric shavers under $50 have this feature and you can easily change the heads. This depends on your product though as the replacement is often done periodically within six months to 2 years. Since you have the information you need, it would make sense to compare different models before you finally pick your budget electric shaver. To save you the hassles of researching and checking all of the nitty-gritty of all available budget shavers, we have compiled this review of the best electric shavers under $50 to help you make your decision. Our decision is based on the results of several research and reviews that include customer feedback as well as experts opinions. So, I’m hoping you’ll find your pick among these seven recommended picks even before you reach the concluding part of the article. The Philips Norelco Electric Shaver 3100 is not just affordable, it is excellent and its comfortable shave with its precise operation has made it a solid choice among many people who cannot but heed the shaver for its balance of value and functionality. Stand-out features include a great build quality, ultra-precision blades that conforms to body contours, as well as a performance similar to those of the premium-priced models. Everything about the SweetLF Electric Waterproof Rechargeable Trimmer is premium except for the price. It’s got an overload of features that includes a 3D Floating Head, a fast charge feature along with USB quick-charging, the important pop-up trimmer, an advanced waterproofing system as well as both wet and dry shaving capabilities among other features. It works great and shaves gently and clean. Usage is superb and cleaning is a breeze. 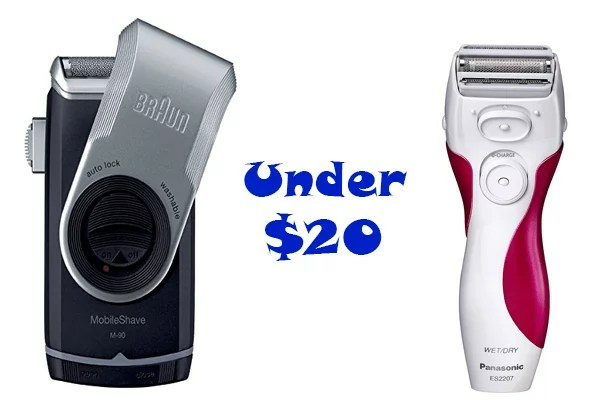 The rotary shaver is priced so low and it is an unbelievable bargain in a market where similar features may cost a few more hundreds of dollars. I love value-adding products and this Remington F5800 Electric Razor just can’t fail to come on top as far as the best electric shavers under $50 are concerned. The shaving efficiency is superb and made possible by a wide collection of features that includes the Interceptor-Shaving technology between the foils to pre-trim long hairs for a closer shave. Other great features include the pivot/flex head, the cordless operation of up to 60 minutes as well as a host of other performance-driven features. When a product becomes an ‘Amazon Choice’ product, you know it is really good and is preferred by a lot of people. The Remington F5800 shaves clean, smooth, comfortable, and good. Another Remington Shaver to the rescue and this time it is the PG6171 also known as the crafter. The shaver ships with an 11-piece kit with self-sharpening steel cutting blades. It has a powerful Li-ion battery that delivers up to 3 hours or operation as well as a quick charge. It is fully waterproofed and you can clean it easily under running water. The PG6171 has enough accessories to help you manage your shaving and trimming needs at an affordable cost. Full accessories, powerful battery, super comfortable use and maintenance, excellent shaving operations capped with an incredibly affordable pricing makes The Crafter a great choice for budget shoppers. This affordable electric shaver from one of the best electric shavers brand is the ultimate king of value. Its advanced tech and features make it a rock-solid choice for lots of men who love the precise, smooth, and comfortable shave it delivers. It comes with self-sharpening blades designed to cut perfectly without irritating the skin in any manner. The battery charges for an hour and delivers up to 70 minutes of run time, the lift & trim technology in use ensures perfect trimming further aided by the 17 built-in precision length settings. In this Philips Norelco Beard & Head Trimmer Series 5100, you have one of the world’s best electric shavers under $50. If your budget has taken a hit but you still want to look gentlemanly, then this is what you need. This highly affordable shaver is one of the best electric shavers under $20 and so is well below the under $50 price point. It is purposely designed for the ladies and so it sports this kind of feminine look. It’s ergonomically designed and so you can grip it and use comfortably. The motor is kinda quick for a shaver in this price range and it is a highly sought-after product. It’s been around for a while and has garnered thousands of reviews and still manages to hold its ground. This female-specific shaver is designed to rid your arms, legs, and other body areas of unwanted hairs. It has so far lived up to expectations -and beyond! The Braun brand of electric shavers is synonymous with quality and the Braun M90 Mobile Shaver is a great ambassador of these qualities that have come to be known with the manufacturer. It has a wide floating foil which we’ve previously discuss its importance in getting a close shave. There is also a precision trimmer for mustaches, sideburns, bikini lines, and more and the shaver ships with a twist cap to guard the foil when it is out of action. The shaver is one of the best electric shavers under $20 and is powered by AA batteries. The Braun M90 Mobile Shaver is popular among shoppers on Amazon and all of the other popular online marketplaces. It is affordable and will easily handle all of the basics of trimming and shaving. It is no doubt a great bargain for the price. Here, we won’t be crowning any winner as you’ve got options from two categories even in the lowest end of the price spectrum. You may go for the Philips Norelco Electric Shaver 3100 or the SweetLF Electric Shaver in the range approaching the $50 limit. You may also go for the other models on the lower end such as the Braun M90 Mobile Saver and the female-specific Panasonic ES2207P Ladies Electric Shaver which were our pick for the best electric shavers under $20. It is all a matter of preference and choice. So now you know that you can still get good electric shavers under $50 despite being on the lowest end of the price spectrum. As you would have noticed, we even got like two of the best electric shavers under $20 that made entry into this list of the best electric shavers under $50. Choose your pick from these budget pick, your budget can not even hold you have.